Silversea's Silver Cloud expedition ship. Seabourn recently revealed that it has signed a letter of intent to build two new expedition ships, with the first arrival in 2021. With the announcement, Seabourn has one-upped Silversea in the luxury expedition category -- just two weeks after Royal Caribbean announced they are purchasing a majority stake in Silversea -- as Silversea hasn't announced any plans for new-builds in that arena. All Silversea’s expedition ships -- and they still will have many more than Seabourn- -- are renovated, older ships from other brands or their own converted luxury ship Silver Cloud, with Silver Wind likely to follow. Seabourn is not saying much now about the upcoming ships; the details will come out in early 2019. But let's presume they're Seabourn quality and new. That means they will be pretty darn good. At 23,000 tons and holding up to 264 customers on board, they will be small, but very spacious ships. Plus, when they are in Antarctica, they will limit the number of people onboard to the mandated 200 head count the way that Silversea and others do. 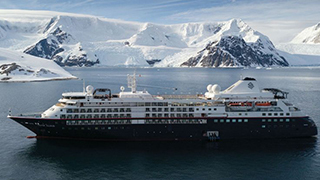 These ships will join other ships specifically built for luxury expeditions (Scenic, Ponant, CelebrityXpedition among them), and Silversea is not in that category yet. The expedition ships of Seabourn will have a far higher space ratio than current Seabourn ships, and, indeed, any other luxury expedition ship. Seabourn's space ratios currently range from 67 to 70. Regent Seven Seas Explorer, Silver Shadow and Silver Whisper have the highest space ratio of 74 for mainstream luxury ships (i.e. not expedition). The space ratio for the new Seabourn expedition ships will be 87. Silver Cloud, just recently turned into an expedition ship for Silversea, has a space ratio of 66. The smaller the ship the more important the space ratio becomes, because if you have a bigger ship there are more places to hide and do things. If you have a smaller ship and the space ratio goes down, it gets noticeably tighter, so Silversea will likely have some tougher competition to beat in the field come summer.